I’m working on a region for my world, and I have a very distinct idea of what I want the physical landscape to look like. Below is a description of what I'd like for the land, and an approximation of how it might have been formed. Location. The region is on the equator of an earth like planet. It’s a large coastal tropical lagoon of approx 20,000-25,000 square kilometers, smack on top of a volcanically active fault. The fault has formed sharp mountains and cliffs on the border of the coast that isolate it from the mainland, and it's an approx 50km from that border to the sea. The entire coastline is subject to seasonal torrential rains, up to three meter tides, and high humidity. It is in short, very wet. Karst: The lagoon is home to a large variety of corals, many of which have evolved to grow right up to the shore. The coral built up massive limestone deposits, which water erosion and tectonic plate activity fragmented into a patchwork of cliff plateaus and karst formations, with limestone pillars and arches rising as high as 12m or even 15m meters over the water. There are also a variety of lower platforms and mushrooms shapes, and deep sinkholes, leading down into a network of flooded limestone caves. Some of the pillars also have their own pools on top, flooded sinkholes left by the rain. These may let off waterfalls in heavy weather. Columnar Basalt: Below the karst, a lot of the ground is made up of stairs and platforms of crumbling columnar basalt, brought in by multiple volcanic eruptions over time. These formations clusters around the broken up limestone plateaus, overlooking beaches of black sand colored by the basalt, and many interlocking pools. Coral Pools: Coral grows in the pools, and at low tide much of it is exposed like a strange garden. At low tide I'd like most of these pools to range from about 5m to 20m across, and 1m to 10m deep, excluding sinkholes. At the highmark much of the area is flooded over. Volcanoes: While most of the basalt lava came from the large bordering mountains, some of may have come from volcanoes located inside the karst region itself. If so, these might form small islands in the lagoon. Is this region geologically possible? Not necessarily plausible, I'm fine with assuming ideal conditions so long as there's an adequate explanation. If not, is there a way to tweak it and make the landscape to look as close to the above description as possible? If yes, would the geology described imply any other natural features that I should also include in this area. Here are some potential problems I identified while researching. This is my first crack at constructing a geology, and I’ve been learning as I go, so I have little notion whether any of these items are actually worth worrying about. - 1) I haven't found a real world limestone karst with columnar basalt. I'm worried this could be because limestone has a cooling effect on lava, but I've read conflicting things about how that plays out practically in a lava flow, and nothing about the relation of it to columnar formation. - 2) **I’m not sure if if the water will be ideal for coral growth. It might be that the basalt sediment and the heavy rain make the water not clear or salty enough. It doesn’t have to be earth-coral of course, so I could posit a hardier version if evolutionary plausible. More simply, I might also draw on a source of extra salt or even some kind of natural filtration system for loose sediment … but I have no idea if that’s even necessary, or if so how to go about it. - 3) I'm still very much playing with the size and proportions of the region. Is there anything I should know if I make it bigger, play with the proportions, etc.? BOUNTY EDIT: Bounty goes to Will, but other answers are naturally still welcome, particularly if they suggest other likely features of the landscape given the geology. Side note, I wish you could give out a bounty w/out the 24 hour wait time. The karst limestone and the modern coral do not represent a temporally continuous process. We interpret the reticulated morphology created by the Type-2 depressions (Fig. 2) as due to antecedent topography forming a template for later reef growth. It is diffi cult to imagine such a complex pattern developing from any reeflimiting factor such as temperature, salinity, or sedimentation. These cannot be anticipated to vary in such a complicated or geometrically regular manner, suggesting substrate-controlled modern coral framework veneers over the sills (Purdy, 1974). So: your karst (weathered limestone) is a relic from some older sedimentary process. The modern coral is living on it now doing all their coral things, but they did not make the karst. It is good that the karst needs to be old because you want basaltic intrusions. Basaltic intrusions can happen in limestone. Things would get very hot when that happened. Geology: Doleritic intrusion (Jurassic or lower Cretaceous), uncovered by erosion. The intrusion sits in Permian limestones, that were metamorphosed and accordingly turned into marble near the contact zone. The dolerite does not form perfect 6-edge polygon columns that basalt sometimes displays elswhere (Iceland, …), but large columnar structures can be seen. These can be quite spectacular; some of them can actually be circumnavigated with small boats. So 1: Your karst limestone is ancient. It is probably at least partly metamorphosed by its interaction with the igneous intrusions. 2: Columnar basalt intrusions were second to the party. They might be fairly prominent because the basalt would be more resistant to subsequent weathering than the karst. That is the case in Spitzbergen. 3: That whole deal is now on the surface covered by a coral reef. A nearshore sand unit is overlain by limestone, the sequence becomes buried to some depth, the sandstone/limestone interface is intruded by a basalt sill, the sequence is uplifted and eroded into its present form, then partially flooded by the ocean and colonized by corals. A terrestrial sand is flooded by a thick lava (e.g. Deccan Traps-style), the sand & lava are submerged and the limestone is deposited on top, the sequence is buried to some depth then later uplifted and eroded into its present form, then partially flooded by the ocean and colonized by corals. Both scenarios require initial subsidence and/or sea-level rise, followed by uplift and/or sea-level fall. This could happen, for example, if a rift valley is flooded by the ocean then later dries out, or a coastal volcanic terrain subsides and is later uplifted. There are many areas where basalts, karst and modern coral reefs coincide today, e.g. 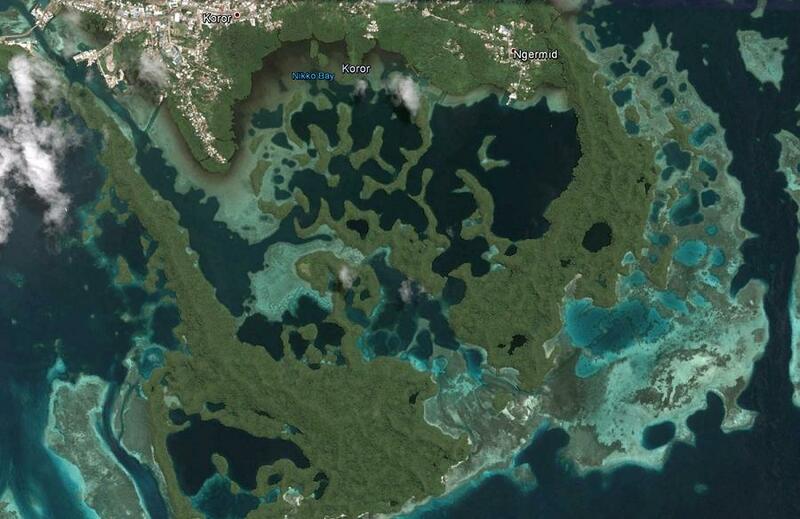 Palau 7.3° N, 134.5° E. Note the vegetation at Palau - in a wet tropical climate your landscape would be similarly vegetated. I agree with John that loose sand under columnar basalt is unlikely. Sand underlying basalt, as you have drawn, would be rapidly undermined, leading to the collapse and disintegration of everything above. More likely is that the buried sand would be cemented into sandstone, which could support overlying columnar basalt (e.g. Yellowstone Park). Edit: I think I, & John, have misinterpreted your diagram as a cross-section with sand underlying basalt. If your sand is instead produced by breakdown of the basalt, then our comments don't apply. But in that case there would also be a lot of coarser detrital material fringing the basalt outcrops, e.g. boulders, cobbles, gravel, not just sand. I haven't found a real world limestone karst with columnar basalt. John and Will mention some. There will be others out there, Pohnpei is a place that might have some (7° N, 158° E). I’m not sure if if the water will be ideal for coral growth. Corals would grow well in this environment, especially as it's regularly tidally flushed. Sediment and freshwater would only be a minor setback to them. I'm still very much playing with the size and proportions of the region. A lagoon 50 km wide and 20-25,000 square km in area is reasonable. For comparison, the Great Barrier Reef lagoon is up to 200 km wide and approx. 200,000 square km in area. The dimensions of your smaller features - limestone arches & coral pools - are also realistic, but real examples can be up to ten times larger. A 3 m tidal range is entirely feasible. Most of the Great Barrier Reef lagoon has a spring tidal range exceeding 3 m.
You need one more ingredient: Changing sea levels. Atolls form when the volcano subsides, or waters rise. If this happens slowly enough you have coral reefs that can keep up with the changing water levels. Low islands are made when the water drpps. Exposed reefs are weathered into sand. The karst got into the air somehow. Either pushed up, or big drop in water levels. 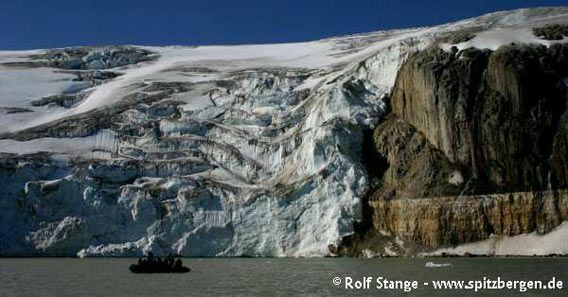 Ice ages can make a 500 foot difference in water levels. (380 feet lower at the height of hte last ice age, 200 feet higher when Antarctica and Greenland finish melting. There are enough odd things in geology that you can have your characters puzzled by parts of it. Geology changes theories frequently too. Compare mountain orogeny to plate tectonics. Compare uniformitarianism to the formation of the Idaho batholith, and yesterday (geologially) the formation of the channeled scablands of Washington State. Or it just exists, and you put this whole discussion at the end of the book as an appendix. Basalt is metamorphic, limestone is sedimentary. They usually do not intermingle much, but let's assume you have a lot of volcanic eruptions and here you go, just some lava fields would be necessary. You need a good combination of water temperature and nutrition for coral growth. On Earth, this have never been the case for an entire lagoon of your size. Also, on Earth, you are not going to get 3 meter tides in a 20,000-25,000 square kilometers lagoon. You need a bigger ocean, or a bigger Moon. Not the answer you're looking for? Browse other questions tagged science-based reality-check biology geology sea or ask your own question. How long would it take a region to geologically settle down after a major cataclysm? Creating an Alternate Google Earth--Is This Possible? Is it possible for a geologically active 'rogue planet' to support life? Would this species be possible? Is this DNA absorbing creature possible?